Aileen Plunkett, Luttrellstown Castle, Clonsilla Co., Dublin, Ireland, sold Christie's house sale, 26-28 September 1983, lot 45. 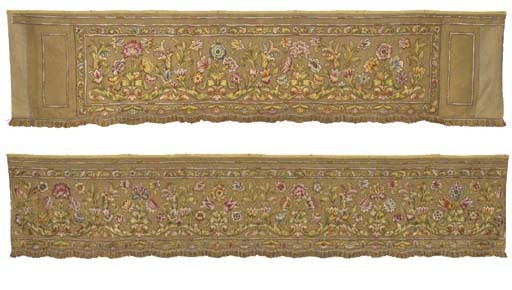 These embroidered hangings formerly belonged to the Hon. Mrs Aileen Plunket, who acquired the the romantic Gothic castle at Luttrellstown in 1930 as gift from her father, Ernest Guinness. In the 1950s Mrs. Plunket set about transforming the castle's interiors together with the celebrated artist decorator Felix Harbord (d. 1981), who had trained in the architectural office of Sir Albert Richardson. She and Harbord bought many pieces from Country House sales. The house was famous for its lavish parties, and was frequently visited by royalty and heads of state. For further information on Luttrellstown castle, see lot 130.